Larinda Meade, painter and printmaker, focuses on exploring the Maine and New England landscape. A studio arts major graduating from SUNY Potsdam, she worked as an art teacher, adult educator and administrator. She has also studied photography and printmaking at various post secondary institutions throughout her career. 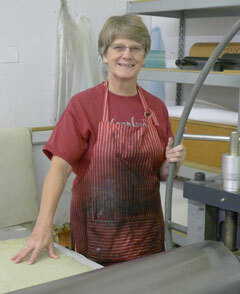 Larinda’s current work focuses on printmaking, mainly intaglio, to express her vision. She uses the landscape as a means to make meaning, by creating a feeling of quiet and calm while communicating her love of the landscape. Her process is one of centering and grounding as she works. Larinda’s practice is to walk, sketch, and take snapshots of what appeals to her eye. She uses these snapshots as a springboard to her image making, beginning with her first printing proof. She works at describing the landscape that is home to her and uses the printmaking tools of layering, textures and darks and lights to create her images. She skillfully and sensitively combines soft ground, aquatint and dry point to create stirring landscapes. Larinda’s work is exhibited nationally and internationally, including Washington Printmakers (Washington, DC), Sanford Gallery (Florence, MA), University of New England, (Portland ME), D’Amour Museum of Fine Arts, (Springfield MA) and River Arts, (Damariscotta, ME). Her work is collected in public and private collections, among them the Portland Museum of Art, Wheaton College, and the New Britain Museum of Fine Art. She lives in Portland, Maine and is affiliated with Peregrine Press, Portland, Maine and Zea Mays Printmaking Studio, Florence Massachusetts.